Symptoms: The value returned by your Excel formula does not update automatically, i.e. the formula continues to show the old value even after you’ve changed the values of the dependent cells. When Excel formulas are not updating automatically, most likely it’s because the Calculationsetting has been changed to Manual instead of Automatic. To fix this, just set the Calculation option to Automatic again. In Excel 2003, click Tools > Options > Calculation > Calculation > Automatic. 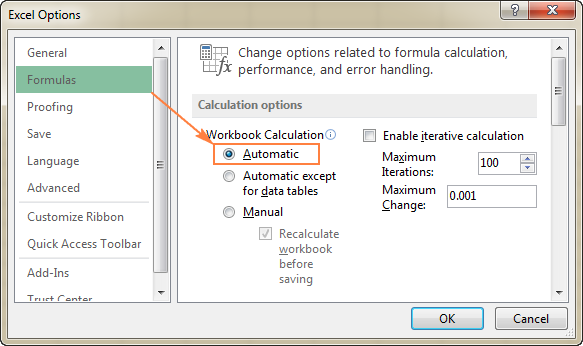 In Excel 2007, click Office button > Excel options > Formulas > Workbook Calculation > Automatic. In Excel 2010, Excel 2013, and Excel 2016, go to File > Options > Formulas > Calculation optionssection, and select Automatic under Workbook Calculation.